Regular dismissal today was at 246pm. However, due to the upcoming intramurals, son's class wouldn't be let off until 4pm to allow them some time to practice. So I waited, watched some students in the lower levels while they played "dampa" with popsicle sticks, cops and robbers, hide and seek or some other active game. It was definitely ruckus and mayhem at the Grand Lobby. And as I sat there, a young girl almost tripped over my foot. As far as I could recall, my grade school years were not as rowdy. Don't get me wrong. I'm saying this with amusement. I marvel at the stamina of youngsters these days. I guess, the only time they are physically active is when they are in school. Right? At home or anywhere else, it's computer, internet or gadget gaming, or tv time. 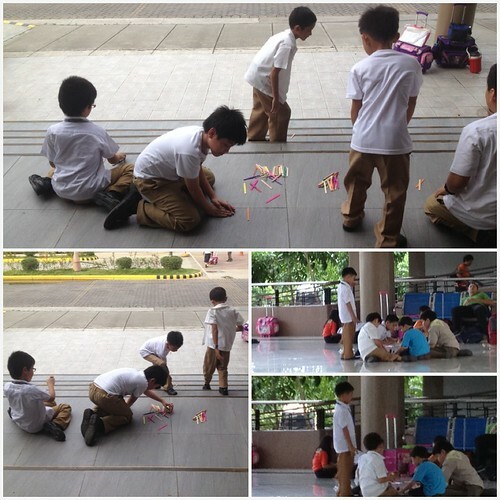 So I try to give our son extra time to play after classes just to partly expend energy. Thirty minutes before 4pm, my thoughts took me back to the 70s during my early grade school years. Please indulge me in my reminiscences if you're up to it. Truth be told, I dreaded school when I was in Grade 1 up to Grade 4. Back in the day, when Pa dropped me off at the campus gate every morning, my tummy would ache, like clockwork. Child stress? Probably... And I looked forward to school dismissal so I could go home right away. If Pa would be late in picking me up, I would kill time in the study hall just doodling. I was so timid I didn't mingle with classmates during free time. Because I was painfully shy, I didn't participate in class too. That was the time I was in an exclusive-for-girls school in Mendiola. I guess I was, to some extent still am, wired like that. It was dismissal time. Jake was flushed and sweaty. "Ma, I'm so lucky today, I won more popsicle sticks! ", Jake proudly announced like it was big news. Indeed, he was clutching a bunch of wooden sticks while he walked in my direction. I smiled as his playmates waved at him and said bye. I realized a long time ago that our grader enjoys being in school. That is a good thing. However, sometimes I worry that he likes being in school more because of play than because of studies, but that is getting ahead of myself. He easily makes friends and plays with everyone, boys and girls alike, as if they are all long-time buddies. Perhaps the son, like his elder brothers, has them (social skills, EQ or whatever else you call them) more and better than I did when I was his age. Thankfully, the son didn't take after me. The previous comment was deleted. I didnt see the reference to time between Grades 1 to 4. :P hahahaha. Yes. you were awkward without your braces and with your apple cut, truth be told. I was awkward all the way through school until now. So Jake doesnt have my neurons I guess. I have always loved school. haha Nerd alert! However, I was painfully shy. Oh I still am. I read about the qualities of an introvert and I can totally relate. I think being an introvert is undervalued in this world.